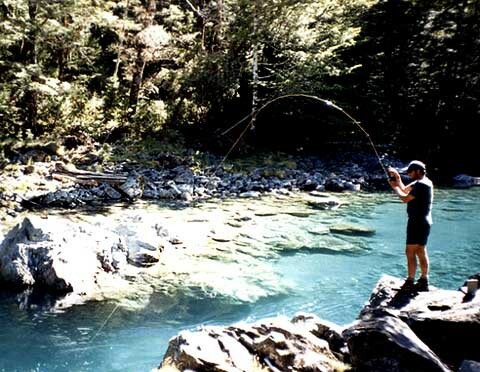 Finn Stinson, operator of “Finns” fly-fishing guide service out of Christchurch, New Zealand, which specializes in fishing for brown trout and salmon. Finn and his brother Ru were world class fly fisherman who had fished in New England, Argentina, Alaska, British Columbia, Australia, New Zealand, the Pacific Islands and countless small streams and river all over the world. The brothers tragically passed away in 2004 in a single car accident while traveling back to Alaska after fishing for Steelhead Trout on the Babine River in British Columbia. They are sorely missed by their numerous friends around the world. Australia is one of the world’s most unique natural habitats. Because it is isolated from most of the world, it has a wide variety of animals unique to its continent, and landscape that seems as impossible to live in as it is stunningly beautiful. It’s hard to justify trying to see all of Australia in just one trip. You will see some of the best beaches, experience some of the most inspiring wildlife, and meet among the finest people the world has to offer. The Australian Aborigines, have the longest continuous cultural history in the world, and were in Australia thousands of years before anyone else set foot on the continent. Europeans explorers came to Australia in the 16th century: first the Portuguese, then the Dutch explorers, and finally English pirate William Dampier. Captain James Cook sailed the eastern coast in 1770, on his famous voyage stopping at Botany Bay and literally running into the Great Barrier Reef. He claimed the continent for the British. In 1787, a fleet of 11 ships, 750 male and female convicts, and four companies of marines landed in Botany Bay. For the new arrivals, Australia was a harsh and horrible place; starvation was a constant threat. Australia’s climate differs a great deal depending on what part of the continent you are visiting. If you plan on staying in the southeast, near Melbourne or Sydney the climate is very nice year round. But up north in Queensland and the Northern Territory it can be brutal. The Australian continent is roughly the size of the United States; unless you plan to take a single long trip there, it will be difficult to see and do all that’s available to you. Focusing on specific parts of the continent is the best plan, so you get the most out of your experience. But don’t think that because you’ve seen Sydney, that you have seen Australia. That would be like going to New York City and saying you’ve seen the U.S. There’s a lot more to this beautiful land than its flagship city. Much of Australia has great weather throughout the year, and there really isn’t a bad time to go. However, from December to February (Southern Hemispheric summer) it can be quite hot, and is best to be on the southern beaches. In the northern parts, in summer, it’s often wet and humid. The oceans to the north can also be unswimable due to the box jellyfish, which is one of many poisonous animal species in Australia.